"It's been like this for the past two weeks," says the listless taxi driver. The rain pours down, a silver curtain, hissing, obstructing all daylight. It is only ten o'clock in the morning, but to Linden, it feels like dusk glimmering with wetness. The taxi driver says he wants to move away for good, flee Paris, find the sun, go back to balmy Martinique, where he is from. As the car leaves Charles de Gaulle Airport and edges along the jammed highway and ring road that circles the city, Linden cannot help agreeing with him. The sodden suburbs are dismal, clustered contours of cubic volumes bedecked with garish neon billboards flickering in the drizzle. He asks the driver to turn on the radio, and the man comments upon his perfect French, "for an American." Linden grins. This happens every time he returns to Paris. He replies he's Franco-American, born in France, French father, American mother, he speaks both languages fluently, with no accent at all. How about that, eh? The driver chortles, fumbles with the radio, well monsieur certainly looks like an American, doesn't he, tall athletic, jeans, sneakers, not like those Parisians with their fancy ties and suits. Circumstances: After the Malegarde family reunites in Paris to celebrate the patriarch's 70th birthday, family secrets threaten to be exposed as the waters of the Seine begin to flood the city. The father is an arborist who seems to love his trees more than he does people. The mother just wants everyone to be happy. Linden believes he's let his parents down, despite his success as a photographer, and his older sister is entangled in an unhappy marriage. A family tragedy combined with the worst flooding in a century, weaken the family's barriers, and long-buried or unacknowledged truths must be confronted. 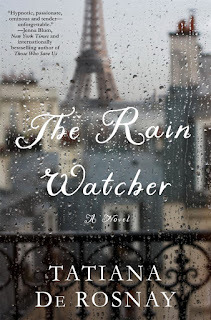 Why I want to read this book: I like de Rosnay's writing and the fact that this novel addresses contemporary issues, family dynamics, and how childhood trauma--if allowed to fester--can affect us throughout our lives. The structure of the novel: The book is told from two perspectives. One is the story of the birthday reunion and the Paris flood; the other is told through the father's diary. Also note that this is not a feel-good, escape story, but a book that deals with real life. An extra: if you understand French, here is a video in which de Rosnay talks about her new novel. 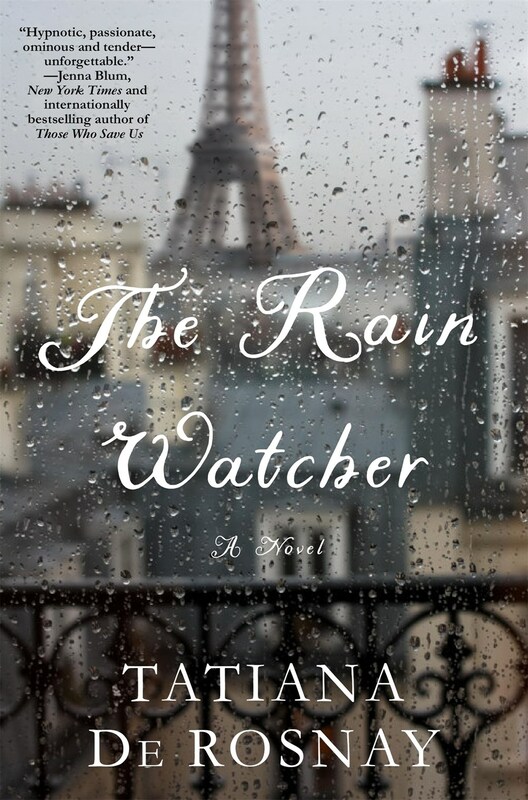 Acknowledgments: thanks to St. Martin's for the finished copy of Tatiana de Rosnay's The Rain Watcher. I love when I find a book with an older protagonist these days -- it's rare--This one sounds good. Sounds like an interesting read. Something to add for my to read list. I like the description of the rain! I hadn't realized she had written another book. I like the premise and the cover, so on my reading list it goes! I reviewed this one for Shelf Awareness & enjoyed it. Coincidentally, I read it during a week of heavy rain & storms here (that all that coincidental given how much rain we've had here this year! ), so it felt even more atmospheric. This one sounds really good. I'm adding it to my wishlist. I love the beginning! I'd keep reading. 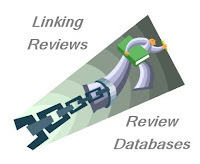 Susan reviewed this book and enjoyed it. I think it sounds good too. Thanks for stopping by Girl Who Reads. Tatiana de Rosnay's "Sarah's Key" was a good read -- this sounds like it would be good too. I didn't know she had written so many books. sound interesting books to read.